And so the strip out commenced. I always tell clients the same thing and it is really is true. It always gets worse before it gets better. Never was this more apt than in this instance. 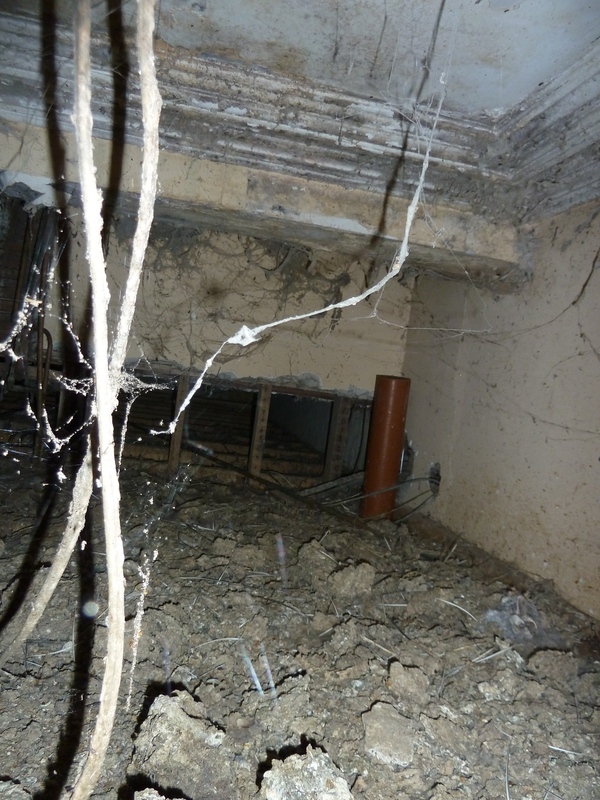 The house was in a serious state of disrepair. It had been unoccupied for some time and had suffered further damage from the pigeons nesting in the attic and living throughout the house. It had also been the subject break-ins. 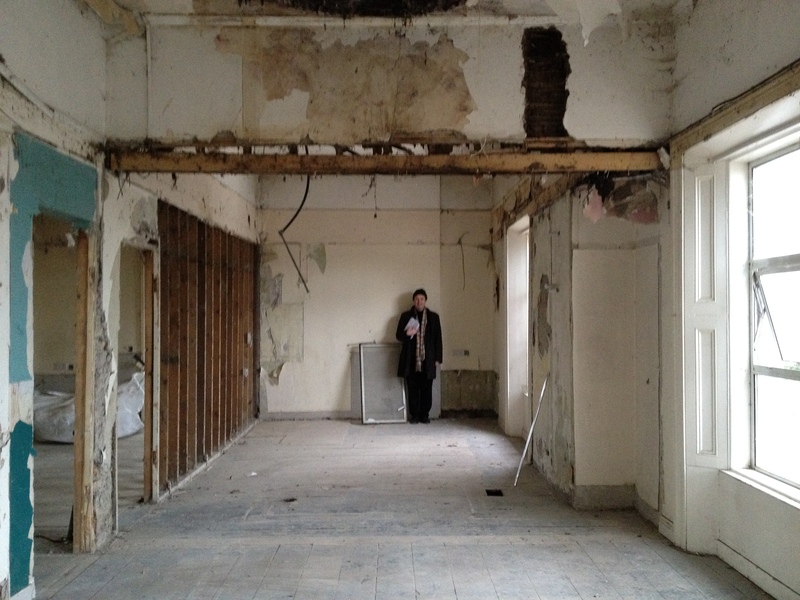 The 17 flats had each contained their own kitchen, bathroom, bedroom and living room. Some were housed in the original 1860s house and others were located in large extensions to the rear and side of the house. 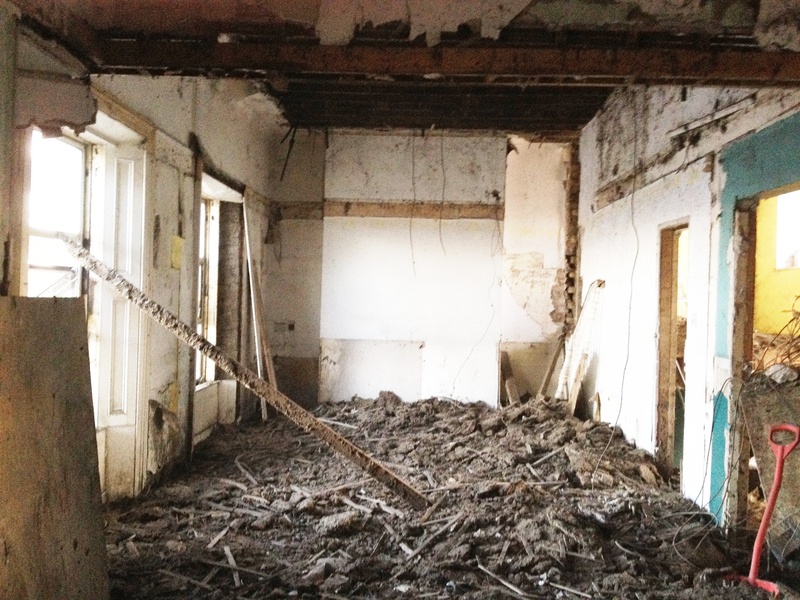 The proposal was to remove most of these extensions and internal alterations and to return the building to a family home whilst restoring any and all remaining architectural features. All work proposed would be sympathetic to the historic property, painstakingly carried out by skilled craftsmen, however, in tandem with accepted conservation strategy, non-historic parts of the property and new elements would read as such, to give a contrasting contemporary feel. But first the clear out had to be completed. Piece by piece the bathrooms and kitchens were removed. 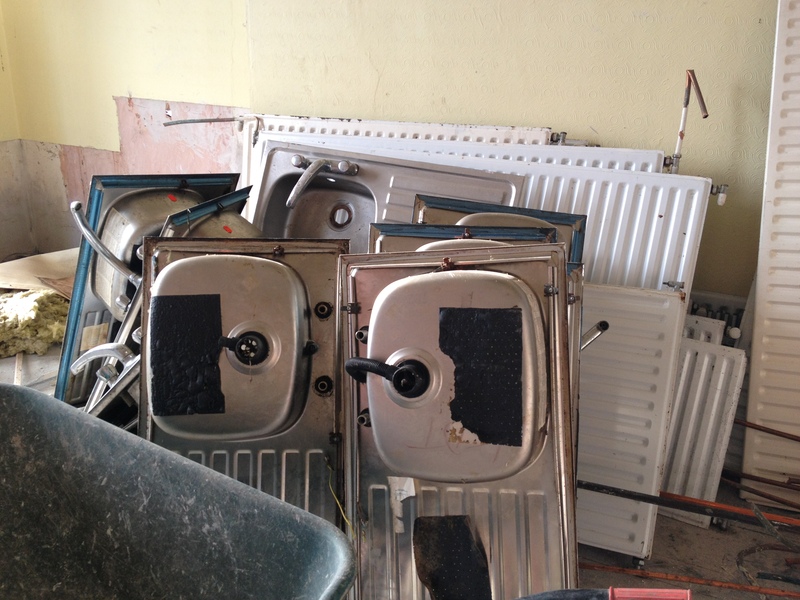 One room was filled with a collection of kitchen sinks and radiators. Meters and meters of piping filled another. 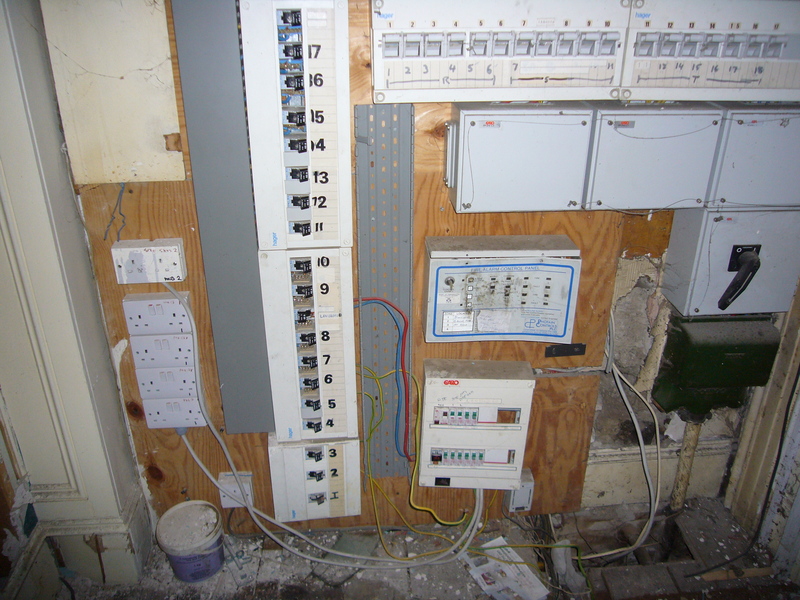 Added to this was lots of electrical cabling. 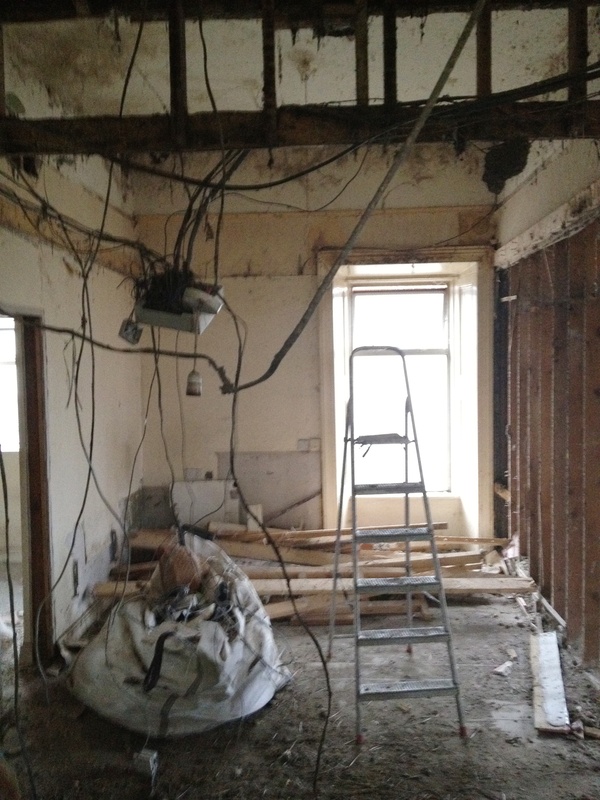 I described before how there were suspended ceilings inserted into each room throughout the house in order to reduce the height of the original rooms which had been subdivided. The birds had taken up residence in between the old and new ceilings and the resulting debris neither looked nor smelled pretty! 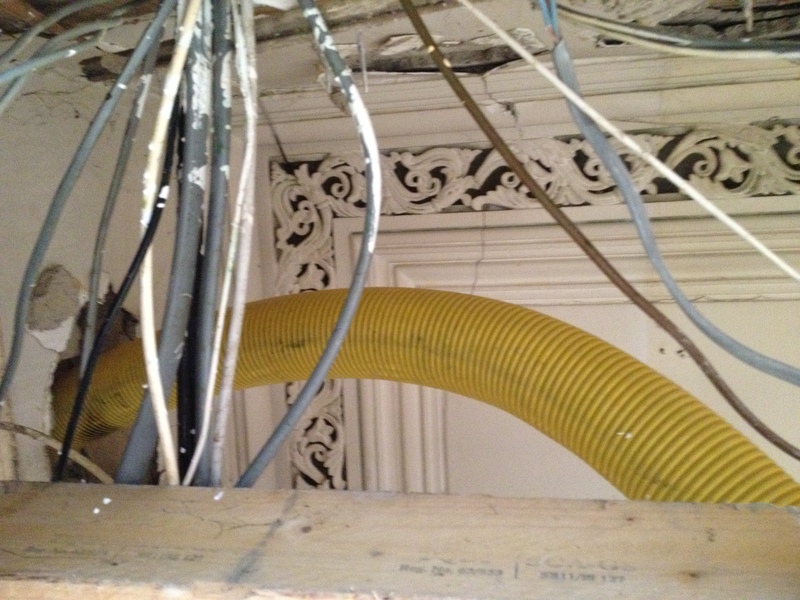 A peak through a hole in the lower ceiling revealed some beautiful cornice work which gave us great hope despite the amount of ducting and electrical cabling punched through indiscriminately. 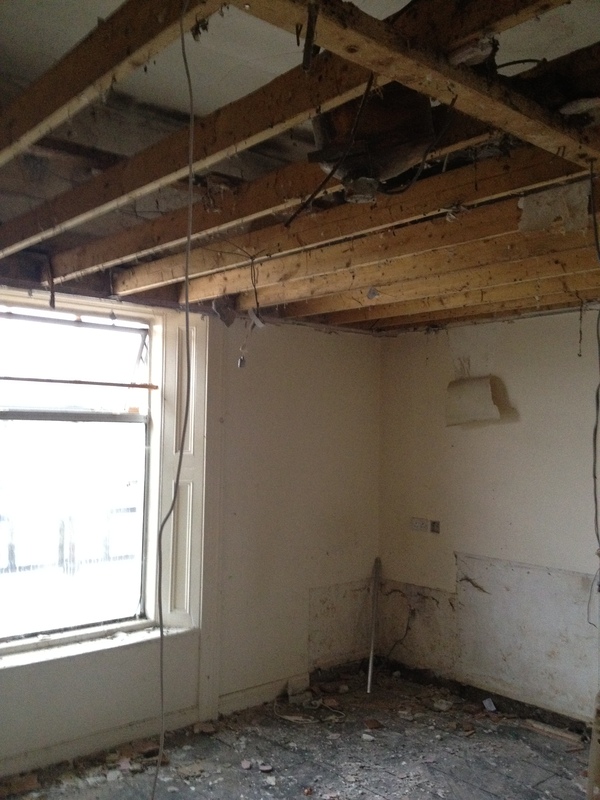 Although damaged the ceiling and ceiling rose was repairable. 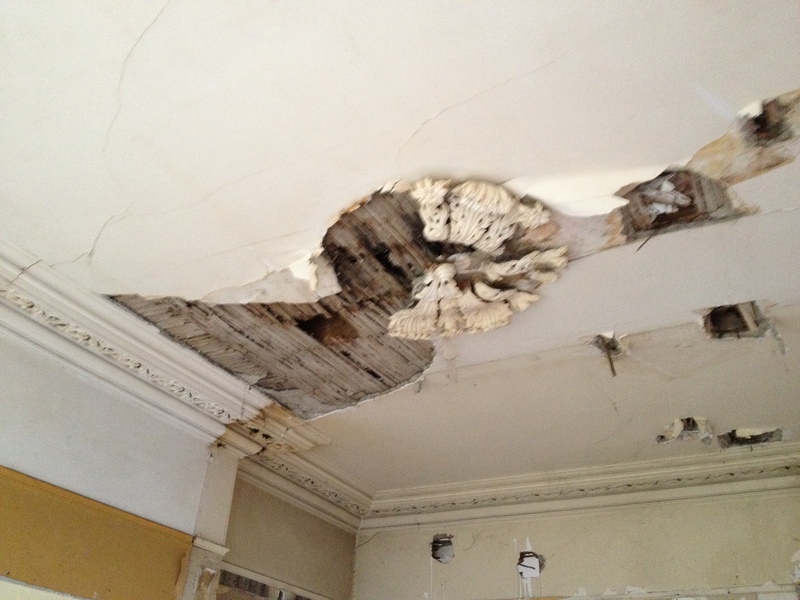 Water had been pouring in through part of the roof causing timber decay and ceiling collapse in places. It seemed the pigeons had called our future home their home even longer than we thought. 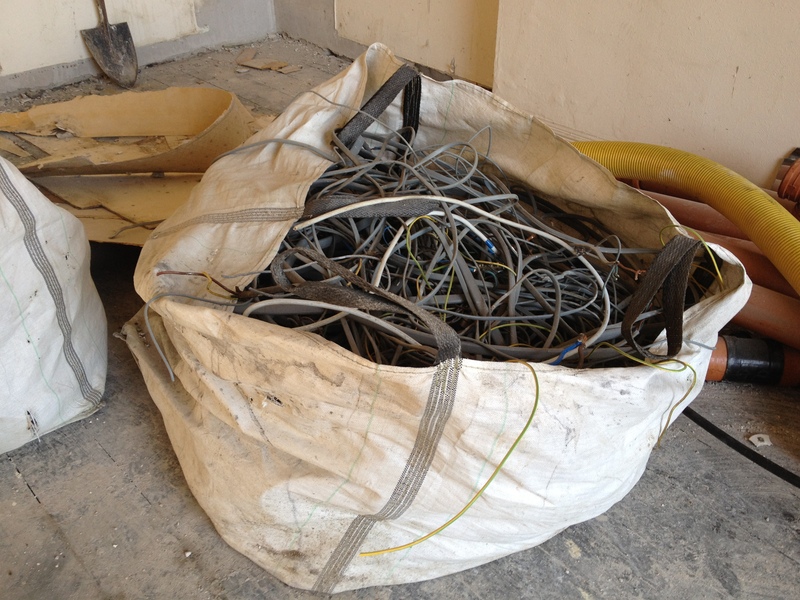 The total amount of guana was removed was in excess of 20 tonnes. The toxic smell required masks at all times which were renewed every hour. This photo gives some idea of the volumes that were involved. 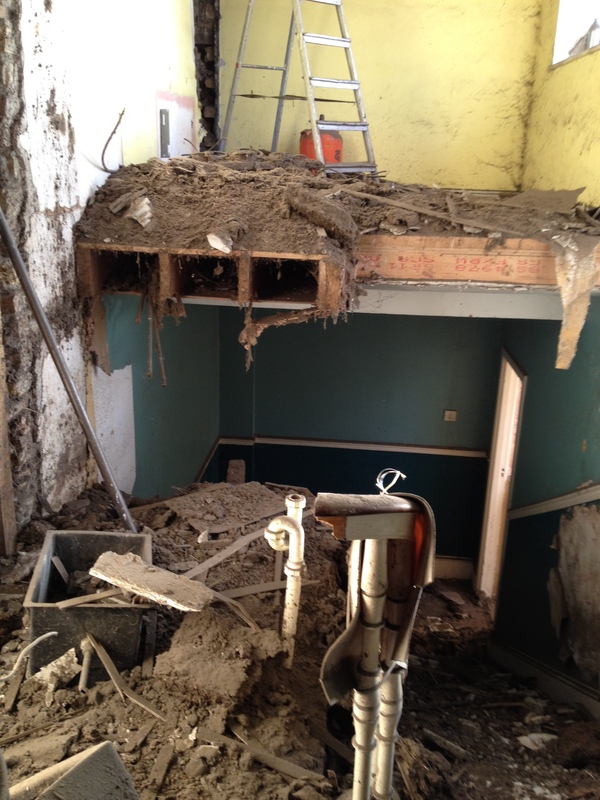 A room that was inserted above the staircase was removed and a bathroom located on the top landing was also removed. 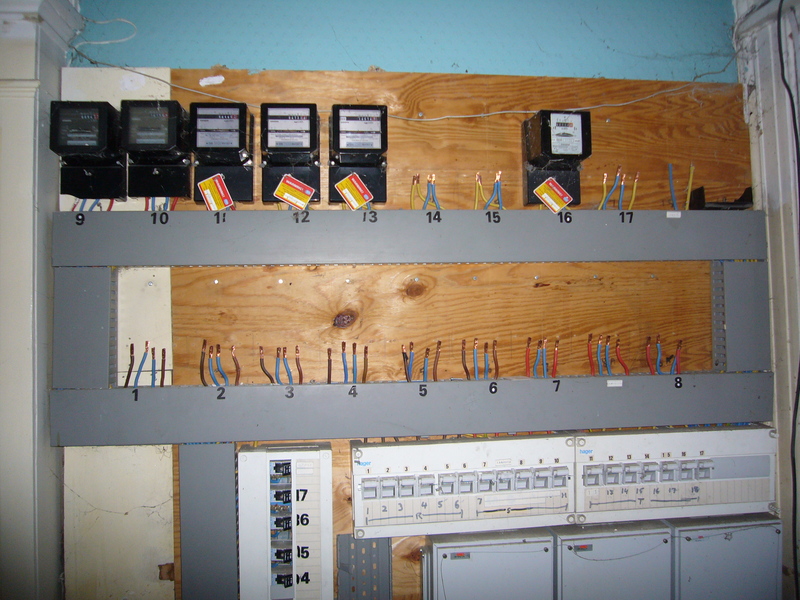 Gradually the 18 electricity meters (one for each flat and one for the landlord) were reduced until there was only one operational. 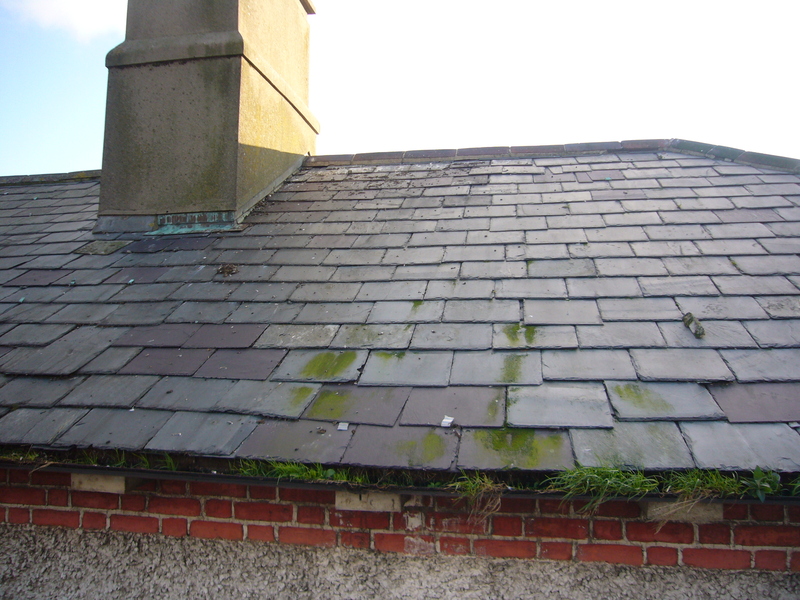 The roof required a a complete overhaul as it was seriously damaged. Original slates were salvaged where possible and then reused on the front of the house, with the rest completed in matching natural slate. 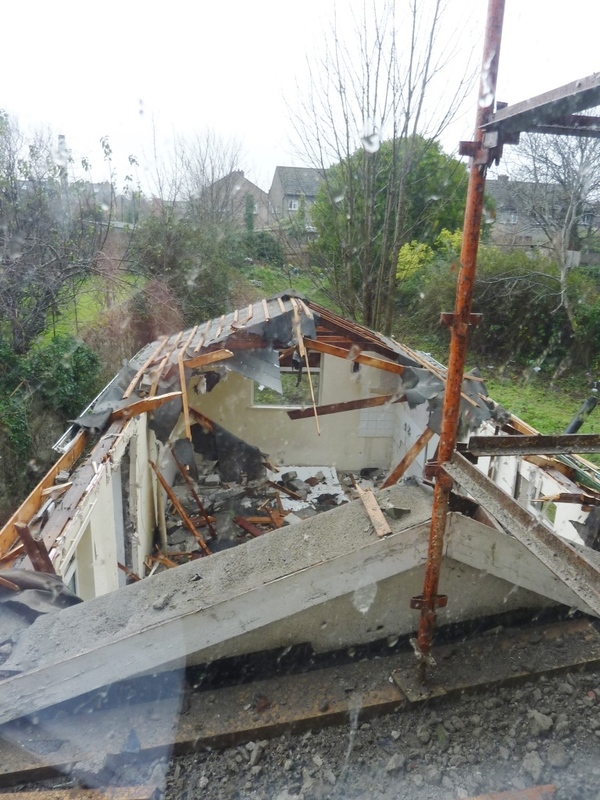 A large extension which abutted the back wall of the house was unceremoniously (or rather very ceremoniously) demolished. Skip after skip of debris was accumulated. 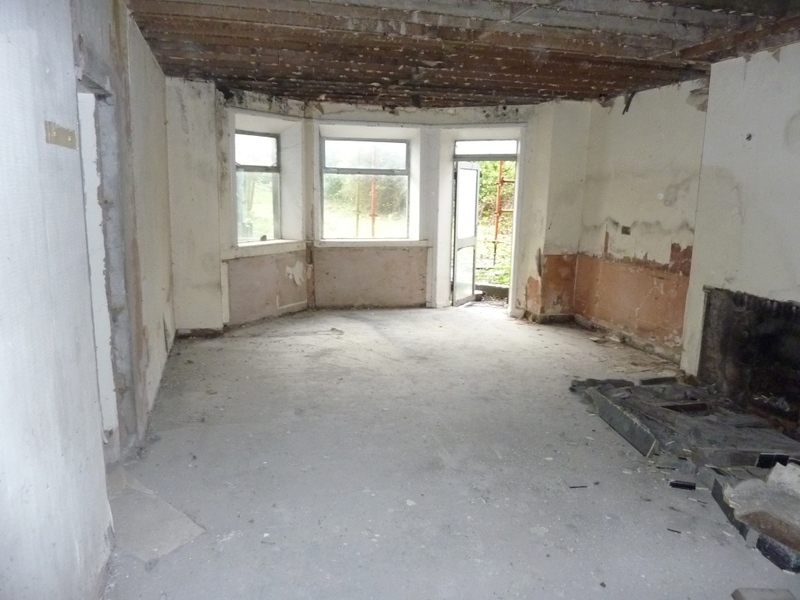 And so with the big clear out completed and partitions sub division rooms removed we could begin to see the real shape and size of the internal volumes of the house. This room previously had a wall down the centre. It would be our future kitchen. 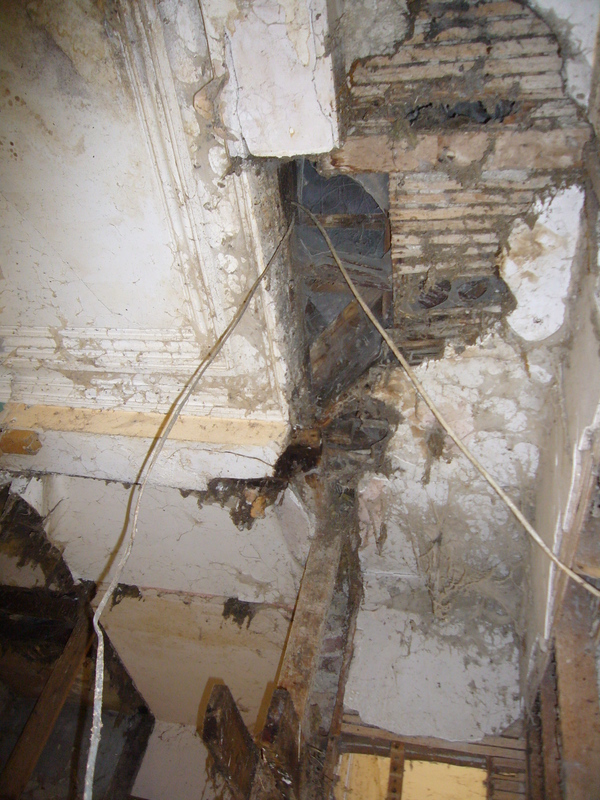 In the entrance hall cornicing although quite damaged from pipes being inserted was revealed behind studwork and false ceilings. The green bin proved useful to catch rainfall! 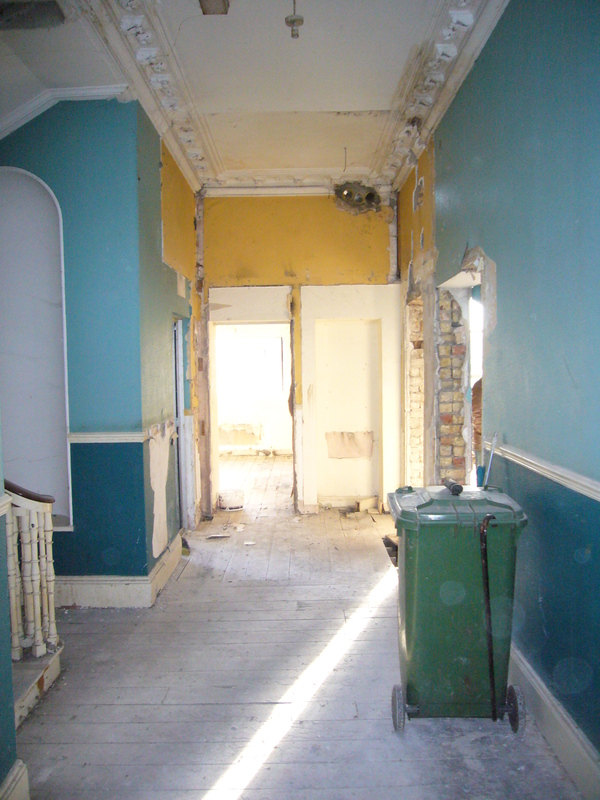 Here, a 1950’s extension accessed off the end of the hall would be retained. Our intention was to adapt this non-original room (accessed through the opening under the yellow wall in the photo above) to form part of a double height dining area adjacent to the kitchen below by removing the floor and dropping the window cill height to ground level of the floor below. 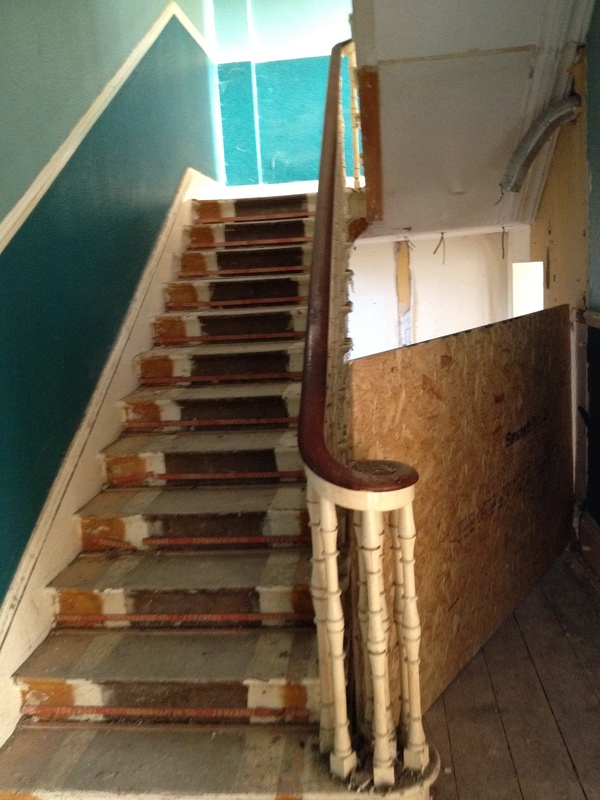 This shows the middle (entrance) level staircase. There was no stair connecting to the level below, as the space had been incorporated into one of the flats! 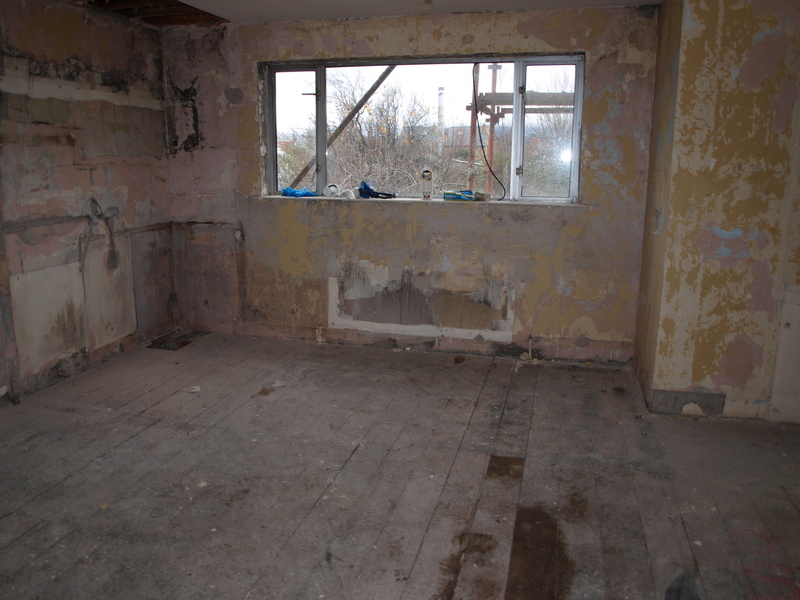 This room had been divided into four rooms: kitchen dining, living, bathroom. The dark line on the walls shows where the ceiling was located. All the original windows in the house had been replaced with aluminium. 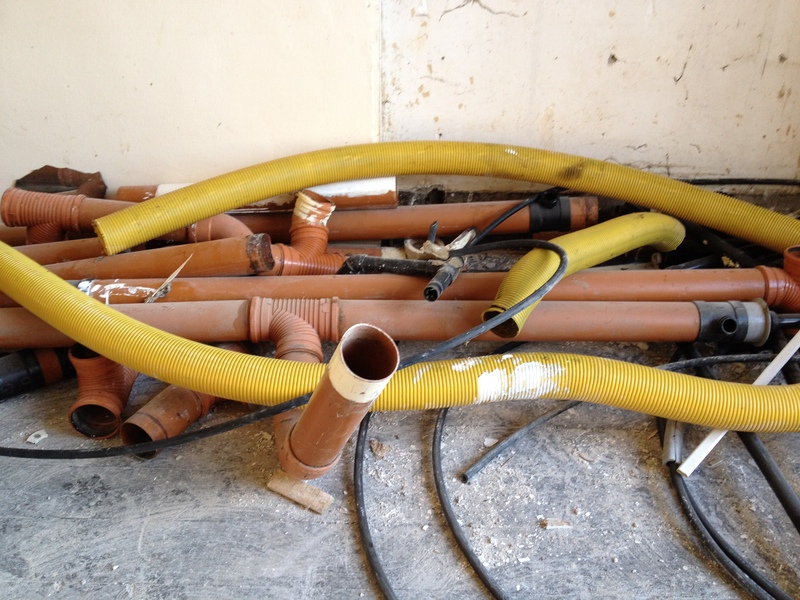 But finally as the clear out continued it seemed as though the house could actually begin to breathe again. The same could be said of us. All in all this was without doubt a very exciting time! Though much of the original material was seriously compromised there was enough there to be able to restore a substantial amount. 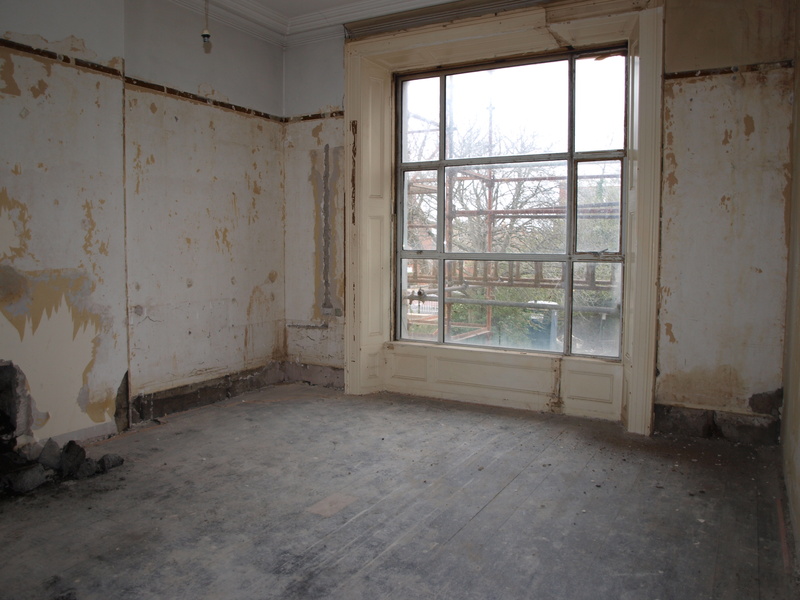 At garden level there was absolutely no historic fabric remaining and whilst this was a shame it did mean that in this area we could plan for a very contemporary interior which would connect with the old house in a series of interesting ways. This entry was posted in architecture, Moving house and tagged architecture, conservation, house potential, interior design, listed building, protected structure, refurbishment, skips by Passionate about Design. Bookmark the permalink. I am so excited to see this transformation. 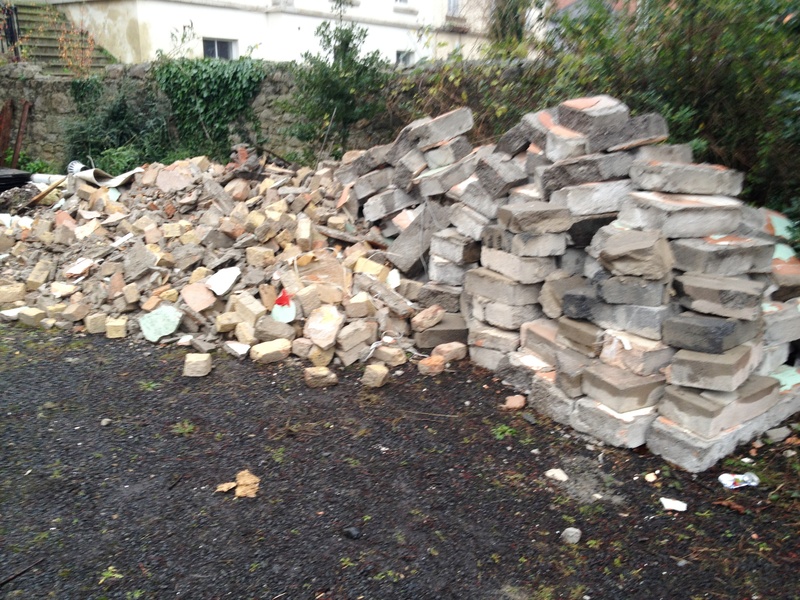 I like renovating old buildings – but you two have vision of a completely different level! Ruth, thank you so much. 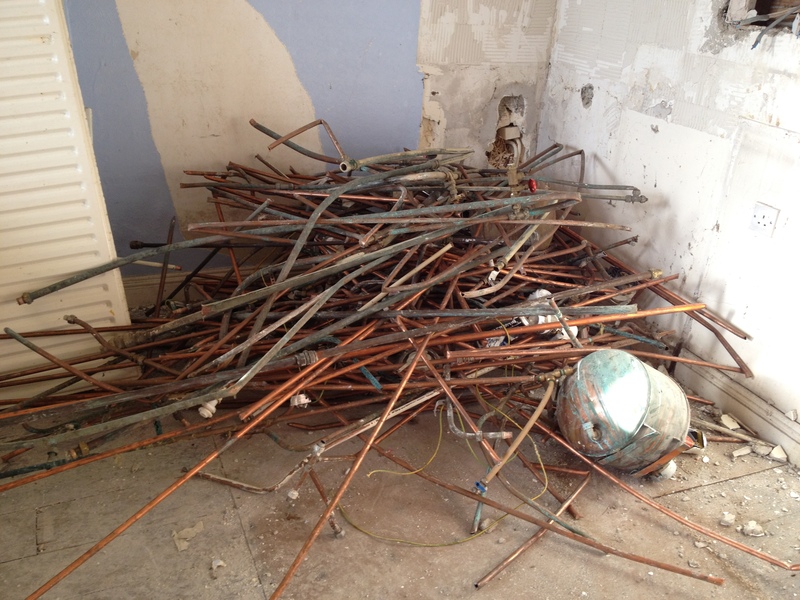 I look forward to updating you with the completed project, which I will do on a room by room basis after this. Thanks Lisa. Watch this space!